Tony Melillo is a menswear veteran with tours of duty at magazines and lines like Generra, as well as his own namesake menswear label. 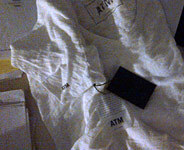 But ATM, the line of relaxed yet refined T-shirts launching at Barneys today, is the designer's most personal to date. "I live in T-shirts," he tells us. "It's my uniform, so I knew it would be something that I could obsess over to perfect the fit and feel." Here he walks us through the year long process of creating the perfect T-shirt, by the numbers. Melillo was having lunch with Mark Lee, CEO of Barneys. "I mentioned that I was thinking about this line of reasonably-priced shirts, made from high-quality cotton. He was onboard, so I started by flying down to Peru to source the fabric." 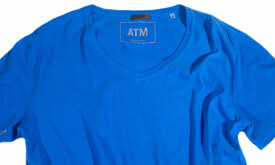 There are three different weights to the pima and slub cottons used for the V-necks and crew neck shirts. The length of time it took to develop the fabrics with the mill in Peru. "They develop the cotton from the yarn, so it was a lot of back and forth to perfect the feel and weight. It's woven loosely for a really comfortable feel. I wanted it to feel like a great vintage shirt, but not have that overly washed or worn-out look." Colors, ranging from "the perfect, soothing shade of cobalt blue to a cool grey." "Branding became very important to me. I wanted it to feel a bit special, so there's a small fabric label, a stamped label and then a small monogram under the arm, where I actually have "ATM" tattooed on my arm." The depth of the V-neck collar, which is not too shallow, but not aggressively deep either. The length of that V-neck shirt's body. A tad longer than the industry standard, for a more modern feel. While the body is slim, it's not clingy. "This is where I really spent time perfecting things. I call it relaxed elegance. As a designer, we should be able to adjust the sleeves or consider other small changes so that it's easy for a guy to throw this on and feel great and look good. My job is to do all the work in the background, like a tailor, so the finished product seems effortless." Melillo once served as the style director for Esquire magazine.